Last week during E3, EA and Sony partnered up to give gamers access to the Battlefield: Hardline beta exclusively on PlayStation 4, and after a few hours of playing the two modes available, I’m ready to talk about my thoughts on it. While Call of Duty has been the perennial champion (in terms of sales anyways) among console first-person shooter fans for the past decade, Battlefield has slowly carved out a bigger slice of the FPS sales pie since expanding from the relative comfort of its kingdom on PC. It’s an extremely respected franchise that prides itself on large-scale vehicular and infantry warfare, as well as an emphasis on teamwork. Now that Battlefield is transitioning into EA's newest annual title, it faces the daunting task of trying to reinvent the wheel each subsequent year to justify a $60 price tag. Battlefield: Hardline, developed by the talented folks at Visceral Games (Dead Space), tries to accomplish the task at hand by moving from the theatre of war to the gritty world of cops and robbers. While the beta is just a snippet of what we can expect when the game launches on October 21st later this year, and despite a talented developer with the pedigree of Visceral, I have some reservations about Battlefield: Hardline that make me wonder if this really warrants a full retail purchase. It’s no secret that Battlefield 4 suffered the series' worst launch ever because, right out of the gate, many consumers were exposed to a myriad of network issues, crashes, and game save corruptions; this doesn't even take into account the absence of popular features that had been implemented in previous installments (ie: squad join-up). To put it bluntly, Battlefield 4 was FUBAR from the moment it launched and, still to this day, there are issues that plague the game on occasion. One has to wonder, how does such a broken game garner an average Metacritic score of 81 across all five platforms? Hell, in hindsight, and despite being a big fan of the Battlefield brand, I sometimes wonder if maybe I was a little too generous when I gave the game a B- last fall. Upon firing up the beta for Battlefield: Hardline, I was pretty excited to see if the switch to the “Cops & Robbers” theme would give the franchise a much needed shot in the arm. It’s a subject matter that is often overlooked in favor of the overused military fare, and why not, who doesn’t love the idea of using fighter jets and tanks? The PayDay franchise, although primarily a cooperative game, captured the excitement of pulling off a high stakes heist and watching it spill over into the streets as you fight your way to your escape vehicle. In war, it's sometimes hard to differentiate between who is “good” and who is “bad," but when it comes to cops and robbers, there's no gray area when it comes to who the good guys and bad guys are. You truly get to be a bad guy when you’re playing as the criminals, and it adds an extra layer of excitement when you know the rules don’t apply to you! "Levolution" is back and bigger than ever! Despite all of the potential inherent in the concept of Battlefield: Hardline, I was ultimately disappointed after 4 hours of playing through the beta. In my honest opinion, the best way to describe Battlefield: Hardline is to compare it to Battlefield Bad Company 2: Vietnam, in that it feels like an expansion of Battlefield 4, rather than a brand new experience. Even though Visceral Games is working on this title, there wasn’t anything about this game that made me stop and think to myself, “Oh yeah, I can tell Visceral made this." 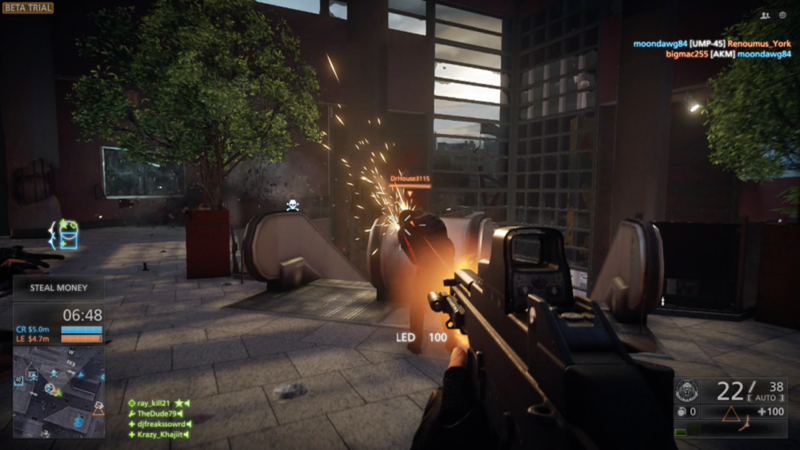 The gameplay mechanics, in addition to the character models and their movements, featured in Hardline seem almost identical to those in Battlefield 4. Granted, we are still four months away from launch, but in my experience, despite the often used “This game does not represent the final build” notification that all betas have, I don’t expect any massive wholesale changes, other than the usual weapon tweaks and small aesthetic improvements, by the time the game goes gold. This seems like Battlefield 4, re-skinned with cops and robbers, with tanks and jets removed (is that a good thing?). Even the, admittedly limited, game modes included here are modified versions of capture the flag; nothing stands out as unique. ”This seems like Battlefield 4, re-skinned with cops and robbers, with tanks and jets removed (is that a good thing?)" Compounding my sense of the familiar, I was treated to a “popular” Battlefield 4 glitch when, not even 20 seconds into my first game (and persistently throughout thereafter), I jumped into a helicopter and noticed that as we were ascending, there were no vehicle sounds whatsoever. Now, had I never played Battlefield 4, I would’ve simply thought to myself, “Oh well, it’s a beta. I’m sure that will be fixed!” However, seeing as I experienced this very same issue for months after the release of Battlefield 4, I was actually saying to myself, “Really? This is STILL an issue?” Another issue that has made its way over to Battlefield: Hardline is the inability to step over small objects. I will say that it has been reduced greatly, but there were still several occurrences, while engaged in a gunfight of course, where I was stuck on an object on the ground that any 2 year-old could simply walk over. I’m pretty familiar with a lot of Visceral Games' work over the years, but when I play Battlefield: Hardline in its current state, I can’t think of anything that would make me think that I’m playing one of their games. You have the right to remain silent...once that RPG makes contact. Another problem I have with the game – which in fairness, is present in a lot of shooters - is the weapon balancing. Now I’m not a gun expert by any means, so maybe I’m just clueless, but when I plug someone in the chest with a sniper rifle from less than 200 yards away, I don’t expect them to open fire with an Uzi and pull of a headshot instantly. I know we can’t expect developers to make sniper rifle bullets that aren't headshots one-hit kills in their games — because there’s enough camping as it is — but seeing as you already have to lead your targets AND take bullet drop into consideration (these are skills mind you), you would think that pulling off a great sniper shot, regardless of it being a headshot or not, would have some type of reward. Personally, I would love to see you knock a character off their feet for all non-lethal sniper shots. It would give the sniper another opportunity to finish off the target, and would give the victim the ability to slowly crawl to cover to regain his footing — but I digress. The other issue I have with Hardline is the beta's featured 16 v 16 matches — which I understand falls in line with the large-scale shootouts that Battlefield is known for, but works against the notion of breathing new life into this revered franchise. When I think of military war, I think of thousands of troops engaging in combat, which makes sense when you’re playing with 32 players (or more) and respawn is enabled. That being said, 16 criminals (with respawn) taking to the streets of LA in a war against the cops is totally preposterous. It almost seems lazy on the developer’s part to force a formula more believable with military factions into a scenario that, more often than not, usually involves only a handful of criminals. Obviously, large-scale is what Battlefield does best, but it just seems that the theme of cops and criminals would translate better to smaller, more intimate encounters and close quarters combat. Considering Visceral Games is experienced with third-person games, it feels like this could’ve been an opportunity for them to instill their expertise into a franchise that is built more on strategy and team play than Call of Duty, but I’m sure the suits at EA don't want any developer changing their baby too much. ”Obviously, large-scale is what Battlefield does best, but it just seems that the theme of cops and criminals would translate better to smaller, more intimate encounters and close quarters combat. " Despite my concerns that this seems more like an expansion than a new Battlefield experience, it doesn’t diminish the fact that the game looks great and sounds even better. There aren’t many games that can deliver the audio and visual fidelity found in Battlefield games. Bullets whizzing past your head, the high-pitched, deafening tone you hear when a grenade goes off right next to you, and helicopters circling overhead while raining down mini-gun rounds all around you, all sound superb. This game will keep your head on a swivel thanks to the awesome sound design (well, when the audio doesn’t drop out of course!). Character models still look good, lighting is exceptional, and everything runs at a smooth 60 frames per second. Keep in mind that we don’t know anything about the other modes that Battlefield Hardline will be shipping with, nor do we have the first clue about how the campaign will play out. It just seems strange that with all the publicity that comes as a result of hosting an open beta, you’d think EA would want to show off something that is truly new and refreshing. The fact that all I’ve been playing for the last four hours is a re-skinned Battlefield 4 doesn’t do much for me in terms of a sales pitch. Considering that October is becoming rather congested with games – and games that offer up fresh new ideas, at that – it’s hard to imagine Battlefield: Hardline persuading gamers on a budget to part ways with $60 for a game that feels more like an expansion than an all-around new game. I have faith in Visceral Games, so I will give them the benefit of the doubt for now, but I really hope there are some more appealing unveilings prior to launch that help set Battlefield: Hardline apart from the competition.